Nannie Culpepper, Sister, F, 47, S, GA/GA/GA. Obituary for Catherine Elizabeth Kemp. Cemeteries and Obituaries of Houston Co., GA. Abstracted by Addie Paramore Howell from The Houston Home Journal, Perry, GA 1870-1912. Published by Omni Press, Macon, GA: 1982. Transcribed by Warren Culpepper. FHL US/CAN Book: 975.8515 V3c. Harry M. Lewis records, Harry M. Lewis, Fredericksburg, VA, to Lew Griffin, 1995. M. M. Culpepper (F) and J. D. Wilson on 27 May 1906 in Muscogee Co., GA, Bk P-75. E-mail written 2001, Jan 2004 to Lew Griffin from Jeanette Cuthriell, e-mail address. I have been researching Levin and Ann COLLINS for my husband's family. My husband is descended from Levin through his son Henry Wilborn, born in 1833 in Troup Co., GA.
Levin was born 1784 in Delaware, emigrated with parents to GA abt 1797, and died in Upshur County, TX on April 15, 1855. His obituary notice appeared in the Christian Index in 1855, and his estate went through probate court in Upshur County, TX with his son John G. Collins as administrator. Ann (listed Anna in the court documents) died in 1860 in Upshur County, Tx. 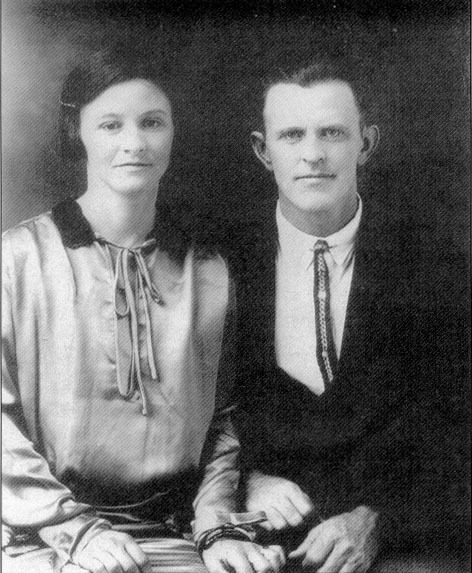 Her estate was probated in Upshur County with Stephen Hallmark, husband of her daughter Ann Kitty, as administrator. Levin had bought considerable property in Upshur and Harrison Counties, TX in 1855. Obviously, he didn't live but four months after the purchase. It took a while to untangle his estate and set the dower for Anna. 1. Isaac P. COLLINS, b. 1810, married Martha___. Isaac P. was in Talledega Co. AL by 1846 and in Harrison Co., TX by 1852; in Bosque Co., TX by 1880. 3. Nancy COLLINS, b. 1816, married James Monroe Culpepper on 22 Dec 1842. She died 21 May 1860(?) in Harris Co., GA.
4. Mary COLLINS, b. abt 1817, married James A. D. Latham on 25 May 1837. She was deceased by 1854. 5. Ann Ritty COLLINS, b. 1818. married Stephen Wilburn Hallmark on 29 Mar 1835. They were in Upshur Co.,TX by 1855. 6. John G.COLLINS, b. 1820, married Rebecca satterwhite on 5 Aug 1843 in Harris Co., GA. They were in Harrison Co., TX by 1852. 7. Seaborn Key COLLINS, b. 1830, married Elizabeth R. Satterwhite on 8 Sept 1852. They were in Upshur Co., TX by 1855. E-mail written Sep 2003 from David W. Jones, e-mail address. In complying with your request to acquaint you with the story of my life, I must first begin by telling you about my ancestors. My grandmother Culpepper and her family came from Georgia, and were of Dutch descent. My grandfather Culpepper lived in Georgia all his life. He fought in the civil war, and was wounded at Gettysburg. He was sent home but finally died from the wound of that awful bullet. My grandmother came to Texas after grandfather's death. My mother's people came from Georgia too; they are of Scotch-Irish descent. My grandfather was the kindest man I have ever known. Great grandfather and two of his brothers fought in the civil war too, but one of them was killed about the middle of the war so both the others came back home, sader (sic) than if all had been with them(?). My Father came to this country in the year nineteen hundred and eight. He bought the little farm on which we still live, the year he moved here. My father was twenty nine years old at this time and had never been married. He met mother soon after he moved, and I believe it must have been love at first sight, if there is any such love, for they had only known one another forty days when they married. My father said he would never have married if grandmother had lived. He loved her so until he would have given up all his young pleasures just to see that she was comfortable. After he and mother married his two youngest sisters and his baby brother stayed with him until they were grown. His blind sister is still living with us, and she seems like one of the family. She loves us children better than any of her other nieces and nephews. 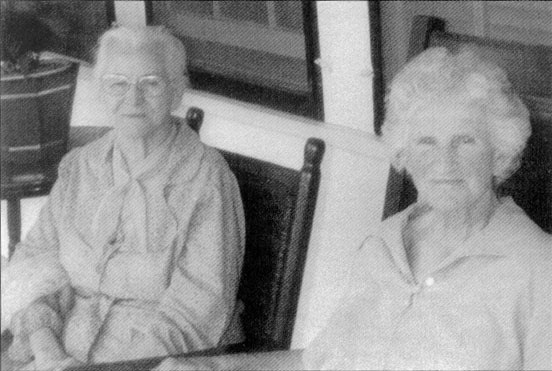 Mother and father had been married a year when Bernice, my oldest sister, was born. 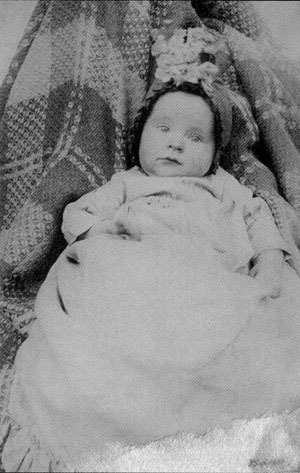 Then I was born seventeen months later; the nineth (sic) of April, nineteen hundred and twelve. I was a very large baby, weighing ten pounds. Mother said she thought I was the prettiest little baby she had ever seen. Mother said my young or baby life was not a happy one. When I was two or three months old I begin to have spasams (sic). If they let my feet get cold I would have one, or if any one scared me I would have one. The doctor did all he could, but he could do no good. He said, he thought I would out grow them. One night I had a little bit of fever, as(?) father had been working hard all-day mother sat in her chair all evening with me, and when father came to the house he took me so mother could cook supper. I had a spasam (sic) when he moved me from mothers lap and one or two more in just a few minutes. Father saw that it would never do to let me have another one so he sat in his chair from six o'clock until eleven without moving. He said he was so tired and sore until he could hardly walk when the doctor got there. I did not have any more that might, but the last one ____(?) ____(?) was sitting under the table playing with the cat,(sic) She scratched me and I started to cry. Mother(sic) saw me. She said I was as pale as death. She ran to me. Then she rung (sic) the big dinner bell for father to come to the house. Father knew something was wrong for the bell was only wrung (sic) at noon, unless something happened at the house. He came running to the house but by the time he got there mother had brought me back to life. I never had growed (sic) much all this time, for they did not know what to give me. After I had that spasam (sic) I went to growing. Mother said I got so fat she was uneasy about me. The first thing I can remember is when a neighbor gave me a little black kitten. I was five year (sic) old. Bernice and I would play with the kitten all the time. Mother and father would try to keep us from playing with it, but we would carry it to the farm. One night we had all gone to bed when the cat got up on our bed and lay down in my face. It put its mouth over mine, and had almost smothered me to death, when the noise of my struggling awoke father. He grabbed the cat and threw it from the bed. I had almost quit breathing by this time. They threw me up into the air, and bathed my face in cold water. They worked with me for a quarter of an hour. I was sick for a day or two. Uncle Lester Endsley was working with father. I went to the field and he put me on his plow and asked me what liked to have killed me. I would start at the first and tell the whole story. I have heard him say since I grew up that he liked to hear me tell the story because I was young and could try to paint out things just as they really were. The first time father ever whipped me was for playing in the mud with my new dress on. I was a lover of mud and water. They had a hard time keeping me out of it. Mother was going to grandmothers she had washed me clean, and dressed me up in new clothes. I got out in the yard where there was a hole. I was making mud pies when father came around the house. He whipped me and I have never cared anything about mud pies since then. I do not remember when Grace was a tiny baby for I was small myself. When she was still a baby mother had to be operated on. I can remember that, for I did not know what they was (sic) going to do with my mother. When Grace was three years old mother had typhoid fever. Father almost lost a crop. He could not get anyone to come stay with her for they were all afraid of taking the fever. When Grace was six years old Bernice and myself thought she ought to do just what we did. Mother would send us to the pasture after the cows. We would go, but would groumble (sic) all the way there and back, because we thought mother loved her better than she did us. My first two years of school life was not happy because I was afraid of my teacher and he tried to frighten me worse instead of try to get me to like him. I donot (sic) believe I could have liked him any way. He was mean to the small children, and good to the larger ones. The rest of the time I have been happy in school. When Miss Grace Dodd taught here at Sand Hill I resolved to be a history teacher. That resolution has grown all the way(?) through my history studies. The first sorrow I can remember in life was when Aunt Verna Hill died. She had been married only six weeks when the flu raged. Grandmother's family was the first around here to take it. Aunt Verna came to help them all she could, but had only been there four days when she took the flu herself. At first it did not hurt her, but she had already had pneumonia once, so it soon developed into pneumonia. She was not sick long for her lungs were already weak. She died November 5, 1918, and was buried in the Macedonia Cemetery. I did not get to go to the funeral for mother had to go and help grandmother. Father left Bernice, Grace, Aunt Nam(?) and myself at home. There was a large apple tree standing at the back of the house which had only two apples on it at this time. Bernice said if I would climb up the tree and get the apples she would not tell father, of course, he had warned us to stay out of the apple tree. I went up the tree and was coming down when I saw father coming, over the hill. He saw me about that time too. He came on home and asked about the apples. We told him we had knocked them with a rack (sic), but he had seen us. He gave us a few licks apiece. Things went on as usual for some time. I was in school, and as I have stated before, I did not like my teacher. One windy day the school house caught on fire. It was falling in when the men got there, so it could not be saved. I was out of school the rest of that year. They built a new house in the summer. School started that winter and our teacher resigned. I had missed almost two terms of school. We were only having only four or five month school any way. This threw me behind in my school work. If we could have had nine month schools I could have been farther along. I will not give up at that for I intend to get an education if possible. Although I never have, or never will have as good a chance as some girls have, but that does not bother me much for I always say "I Can", and that will comfort me when in doubt of succeeding with a hard task. I believe my education is the hardest thing ahead of me. My sisters and I use to have the lovliest (sic) times playing in the playhouse which we built by a good spring of water. We would fence our rooms off with pine-straw and make beds, pillows, chairs, and many other things out of the straw. Mother was always too good to us. She would let us eat up her supper when she was not able to cook any more. We would carry onions and other things to our play-house and eat them down there. I have been in several wrecks in my life. When I was small we would follow father to bring in hay. Bernice has always been unlucky, so she fell off the load of hay. She also fell off a bail (sic) of hay coming from town one day. She went down between the wheel and the wagon. We ran back and picked her up. She was not hurt much. I fell off a wagon one night. We were going up a hill and Aunt Nammie(?) started to fall. I grabbed for her and we both fell off. I would not get back upon the wagon. I walked the rest of the way. I was in a car wreck one night but no one was hurt. We were all scared. My next greatest sorrow was when Bernice like to have died. She was going to school at Bloomburg, Texas, a small town south west of Sand Hill. She had been having chills for nearly a year. We tried every kind of medicine but could not get them broke up. On the tenth day of March nineteen hundred and twenty three she was taken with something like a chill. We gave her medicine but she got worse all the time. That evening about three o'clock it begin to rain. Bernice was still no better so mother called the doctor. He came out there as quick as he could. He stayed about two or three hours. When he started home he told father that Bernice had black jaundice and congestion. He had no more than got home when we called him back. It was still raining and the roads were muddy and slick. He stayed nearly all night trying to settle her stomach. She would vomit up every drop of water or any thing we gave her. She was unconscious from Saturday night until Tuesday. The doctor gave her up Sunday. He said there was no chance for her. On Tuesday my baby sister Mary Lou was born. This was the thirteenth of March. We were all disappointed for we wanted her to be a boy. I was over at Mrs. Lamar's when she told me I had a little sister. I was so mad I did not know what to do. I told them they would never see me with her in my arms. When I went home I would not look at her until mother made me. The baby was two days old before Bernice hardly relized (sic) she was there. Bernice was sick nearly three weeks. She had sixteen needles put into her body. One was a poison needle. It made a large scare (sic) which is still there, but the doctor said that was all that saved her. After Mary Lou got about two or three months old we would not have taken any thing for her. I believe I was prouder of her than I would have been had she been a boy. When she got big enough to look around and could tell one of us from the other I was prouder of her than anyone, for I was next to mother. She would cry and come to me from any of the others. When she begin to talk she could not call my name so she called me "Nunie(?) Bill". Nearly every body called me that when speaking to her. When she was little I would cry every time she had fever, for mother said she would go away and leave me someday for the way I treated her when she was a baby. They told me she would hate me when she grew up but thank goodness she still loves me as I do her. She will cry every time I go off and leave her. I believe my greatest sorrow came when my Grandfather Endsley died. He died May 5, 192(?). He was buried in the Macedonia Cemetery. He was the only grandfather I ever saw. My Grandfather Culpepper died before I was born. My grandfather was the greatest pal I had, and the kindest, best man I have ever known as I have stated before. We do not know what killed him for the doctors would not tell. He was sick for many days, and as his cheeks became pale I greaved (sic) over him. Bernice and I went to see him one day and they had some corn that needed to be thined (sic). We thined (sic) corn all day and when we came to the house for dinner, I was sitting by his bed and we had fun talking. You may say I was young to be talking to a sick man. I guess I was young, but that was the kind of people he liked to talk to. Well as I was saying he looked up at me and said, "Baby how is grandfather's corn?" I told him it was pretty, and he said, "I have not got to see the corn since it was planted." We talked on for awhile about the corn and after awhile he looked at me with tears in his eyes and said, "I don't guess I will ever get to see or work the corn for I will not be here." At first I could not plan out what he meant. All evening I studied about what he had said to me at noon. After he died I know what he had meant(?) by his talk. That was the first one of my relatives I had ever seen who was dead. Well things went on as usual. I had learned to plow and every year I would help father with the crop. I do not think it a dishonor to work in the field as some children do. I know my parents will not be with me always to work and show me how to do the work right. So with the help of God I will do the very best, what ever my task may be, when they are dead. Two year (sic) ago this spring mother had to be operated on again which was the second time. It almost broke by heart to see her go to Texarkana for I did not believe she would get well. She stood the operation just fine and when she was waking up she sung "When We All Get To Heaven," and "Beautiful City." The nurse told mother she had to cry for mother was taking things so hard. We were all proud when the news came home that mother was doing fine. We were the proudest children you ever saw when mother was brought home. Mary Lou had the whooping cough while she was gone. We stayed with Uncle Lester Endsley. Things went on fine until last fall. Father was taken with an awful breaking-out. We tried all the doctors around here. They could do no good. He was sick about three months where he could hardly stay out of bed. We gave up all hopes of him getting well. On the seventeenth of January a man came to the house. He began to ask questions about how father was worked. He told him that it was eczema, but that he could cure him with out a doce (sic) of medicine. Father did not know what to do about buying the jar. We finally bought and father begin (sic) to drink the water. He got better and in two months he was almost well. We were all so proud until we hardly know what to do. Well this is about all there is to my life that is interesting, and this is not much. I will not tell you how much I love you, for I think you will guess near enough from such a long letter. E-mail from David W. Jones e-mail address to Warren Culpepper, 27 Oct 2003. Juanita Culpeper and Cleo Jones are the parents of Bettie Sue Jones, Female, born __ 1933 in Cass Co., Texas. E-mail on 9 Sep 2003 to Warren Culpepper from David W. Jones, e-mail address. Natty M. Culpepper died 3 Jun 1943 in Calhoun Co., Alabama. EMail* � Subject: Help me find my ancester N. Monroe Culpepper b. ca 1896!! Subject: Re: Help me find my ancester N. Monroe Culpepper b. ca 1896!! Melanie, I think your Notley Culpepper is buried at the Antioch Baptist Church Cemetery near Fyffe, AL in DeKalb Co. His wife, Mary, is Mary Frances "Molly" Arnold. She is the daughter of J.L. "Lonzo" Arnold and Mary Ann Caladonia Clifton. I know that Molly had two daughters Maudie and Claudie from a previous marriage to a Whaley. Molly died in 1941 and Notley died in 1943... I'm researching the Clifton family from Randolph County and DeKalb Co, AL. ED 33, sheet 14, line 9. P. 180; wedding day photo from p. 32. Green Culpepper, Prisoner, M, Wh, 30, md@28, AL/AL/AL, Labor/Shirt Factory.